In the first of a series of posts on Southeast Asia’s iconic historical sites, we explain the history and significance of Bagan – one of Southeast Asia’s most incredible archaeological sites. 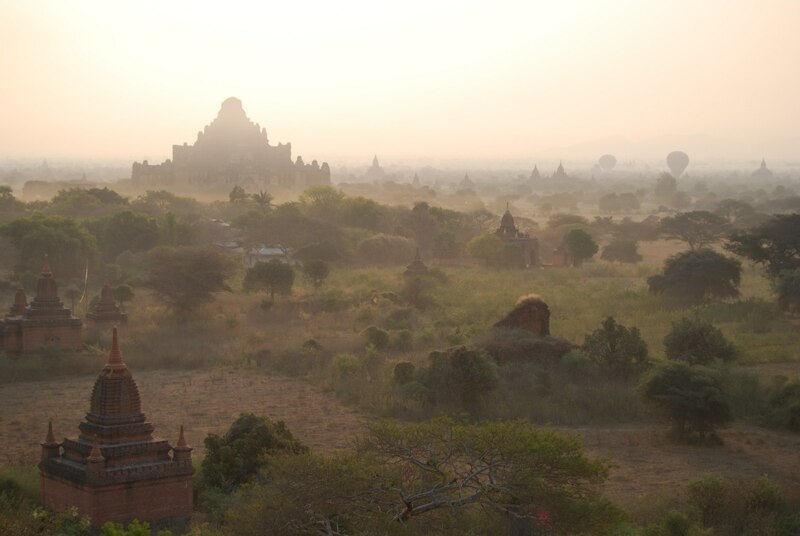 Located in Burma, most consider Bagan to be comparable with Angkor Wat in terms of scale and significance. Like Angkor, it has been the subject of numerous beautiful and atmospheric photos, and as more and more people flock to Burma each year it has become the centre of the country’s nascent tourist industry. Where? In the Mandalay region of Burma (Myanmar), 290 km (190 mi) southwest of Mandalay and 700 km (430 mi) north of Yangon. What? Bagan was the capital city of the Pagan Kingdom, the first Burmese kingdom, from 1044 until 1297. Today the area is home to more than 2,500 Buddhist stupas, temples and monasteries – the largest and densest concentration of Buddhist monuments in the world – but at the kingdom’s height there were over 10,000. When was it built? Most of Bagan’s monuments were built over a 250-year period between the 11th and 13th centuries, when the Kingdom of Pagan was at its height. Some, however, were built somewhat before or after this stretch. How big is it? 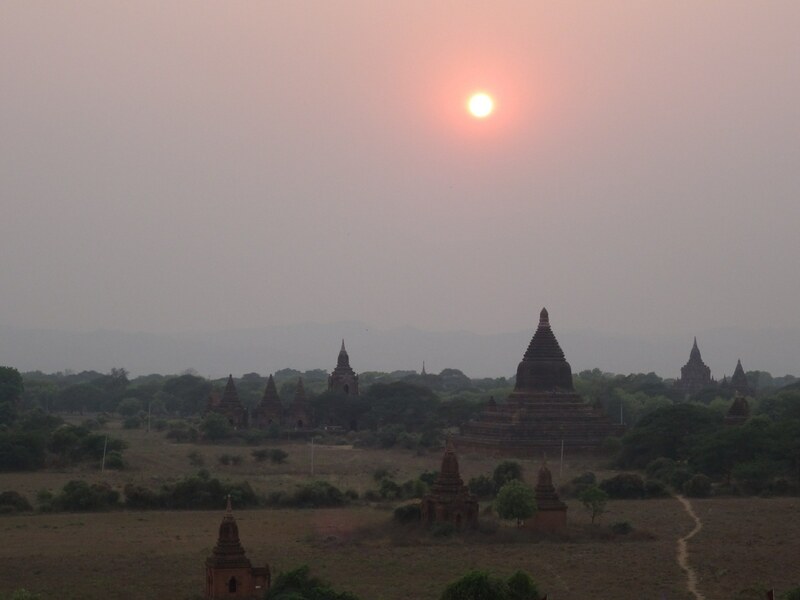 The Bagan Archaeological Zone covers an area 13 km by 8 km (8 mi x 5 mi), with Old Bagan at its heart. It incorporates the Bagan plains, New Bagan and the district of Nyaung-U. 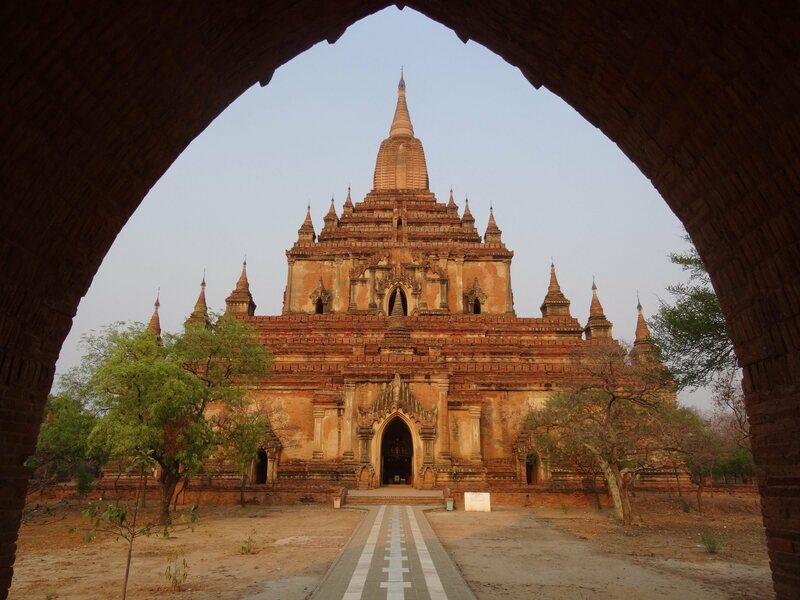 Most of the Bagan temples fall into one of two categories: stupa-style solid temples, and gu-style hollow temples. The Bagan stupas (or pagodas), took their influence from early Pyu constructions as well as India and Ceylon, and represent Mount Meru in the Buddhist cosmos. They are usually bell-shaped, with one or more rectangular terraces at their base, and contain a relic chamber. The main features of the hollow, gu-style temples, meanwhile, are a vaulted indoor chamber and pointed arches. This technique of vaulting is thought to have been developed in Bagan in the 11th century, only to be forgotten by craftsmen in later eras. Bagan started life as a small settlement, thought to have been founded in the late-ninth century by the early Burmans, who had migrated to the Irrawaddy Valley from what is now southern China. The name Bagan comes from the old Burmese word Pugan, which is in turn derived from the older Burmese word Pyugam, meaning “Pyu Village” – and in its infancy Bagan was just one of many competing city-states inhabited by the Pyu people in that region. Over the course of about 200 years, Bagan gradually grew to absorb these neighbouring principalities, and in the mid-11th century King Anwrahta founded the Pagan Kingdom – unifying for the first time the regions that would form the basis of modern Burma. From 1044 until 1287, Bagan was the capital of this kingdom, growing steadily in size and wealth to become a major centre for religion (including both Theravada, Mahayana and Tantric schools of Buddhism as well as Hindu and animist traditions), scholarship, astrology, medicine and law. At this time, the Pagan Kingdom was equal in sophistication and power with the neighbouring Khmer Empire, and attracted monks and scholars from all over South and Southeast Asia. In the mid-13th century, a series of Mongol invasions sent the already rather unstable Pagan Empire into decline. The political fragmentation that ensued continued for 250 years – about as long as the empire’s golden age – lasting well into the 16th century. 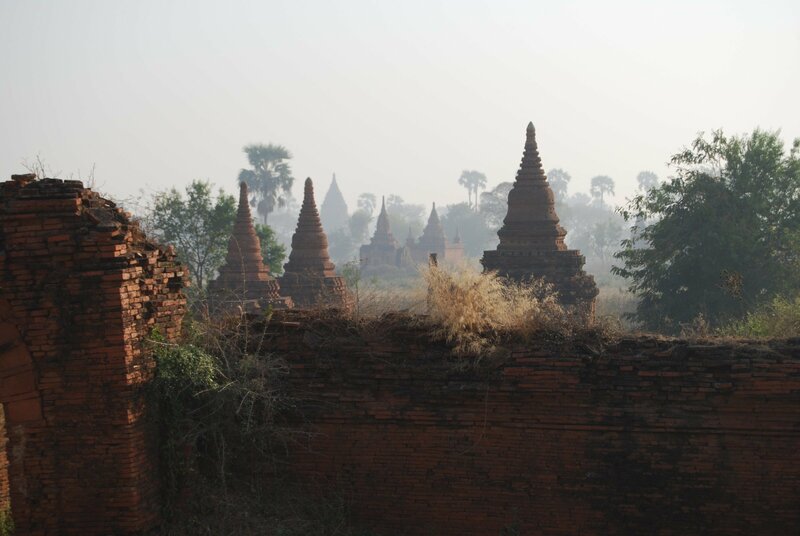 During this time, some religious monuments continued to be built in Bagan, until slowly but surely it halted altogether. Only around 200 monuments were built between the 15th and 19th centuries. Though it has diminished from a city of up to 200,000 inhabitants to a small town, Bagan has continued to survive as a significant pilgrimage site throughout history until the present day. Many of its monuments fell into disrepair in the centuries following the fall of Pagan, while others were repainted or fitted with new religious statues. Between 1752 and 1885, the Burmese state funded the systematic renovation of many of Bagan’s monuments, in a move that is largely considered to have done more harm than good. 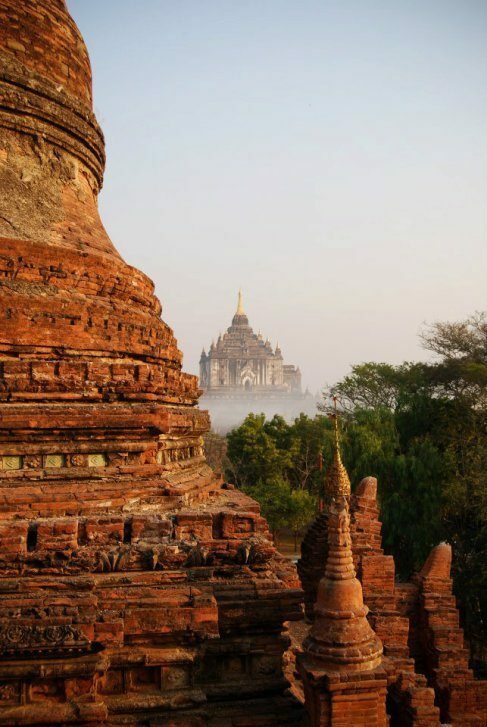 Bagan has also had to deal with numerous earthquakes over the years, some of which have caused extensive and even irreparable damage to temples in the area – notably the Bupaya pagoda, which was completely destroyed by an earthquake in 1975. In the 1990s, the Burmese government once again carried out restoration works on many of these monuments, and once again the renovations were considered by the international community to have been irresponsible and damaging to the integrity of the area. It is due to the botched restorations of the 1990s that Bagan has not (yet) been included on the UNESCO list of World Heritage Sites – despite its undeniable impressiveness and wide-reaching appeal. This is unfortunate, as it means no UNESCO funding for (proper) renovations, or protection to guard against further deterioration. Bagan is at risk not only from the well-meaning meddling of would-be renovators, but also from further earthquakes and from erosion caused by the Irrawaddy River – which has, in fact, already worn away a significant portion of the surrounding area with the strength of its current. Despite this, Bagan is still an enchanting and as yet relatively little-visited archaeological marvel, and constitutes the highlight of most trips to Burma. 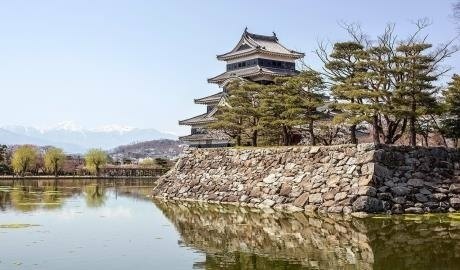 While there are a handful of popular temples and pagodas that receive a steady stream of visitors, there are countless more that remain obscure and undiscovered. Shwesandaw Temple – “sunset temple” – probably Bagan’s most popular tourist spot. A great place to watch the sunset (hence the name). 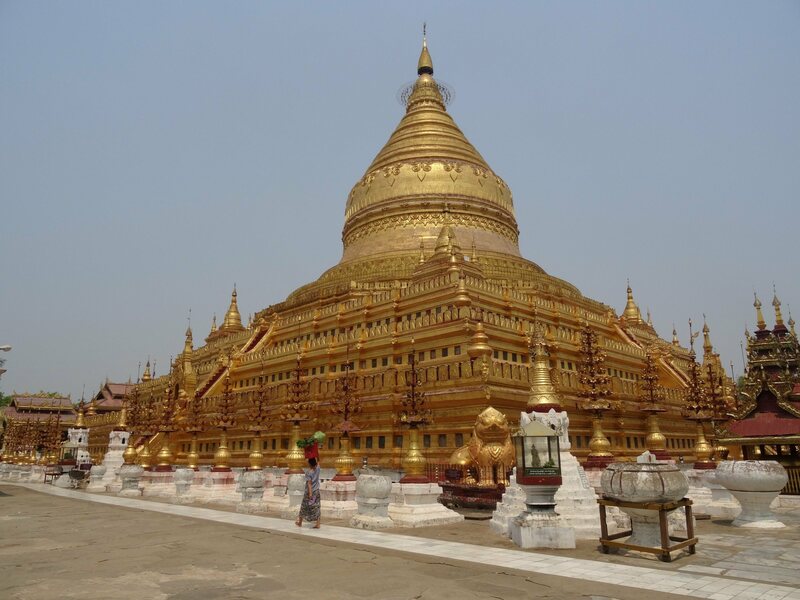 Shwe Zigon Temple – Gourd-shaped golden pagoda, built 1087. This was the model for the famous Swedagon Pagoda. Thatbyinnyu Temple – Bagan’s tallest pagoda, 66 metres high. Built in the 12th century. 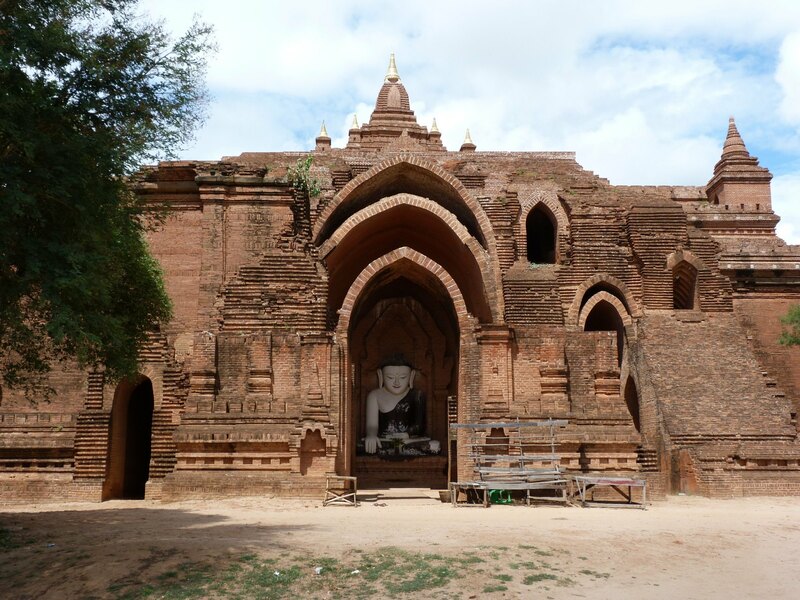 Shwegugyi Temple – One of Bagan’s best-preserved temples, built 1131. Another great (and less crowded) place from which to observe the sunset. 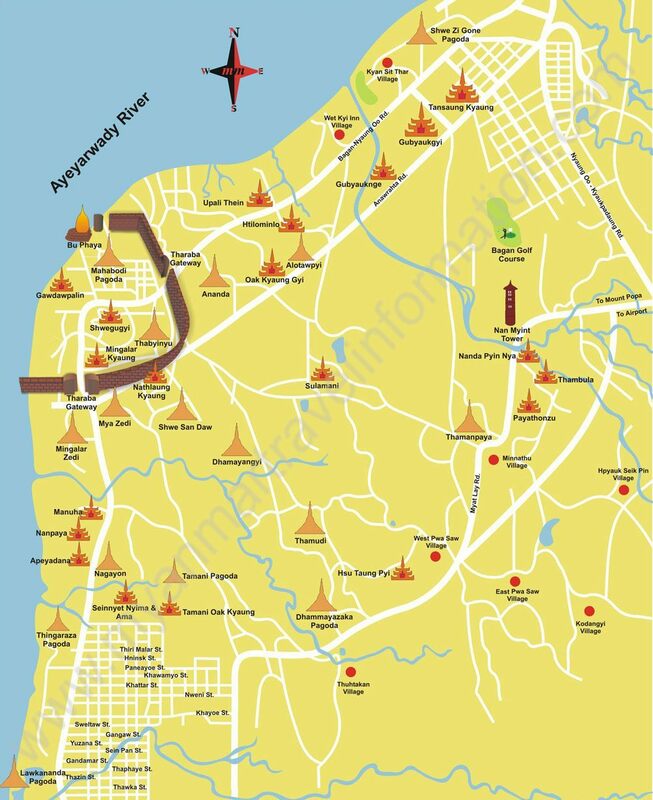 Dhamma Yangyi Temple – Commissioned by King Narathu to atone for assassinating his father, brother and wife. Work on the temple was abandoned after the king himself was assassinated. Gawdaw Palin Temple – Exhibits a fusion of Burmese and Indian styles, with a beautiful courtyard and interesting bell hangers. 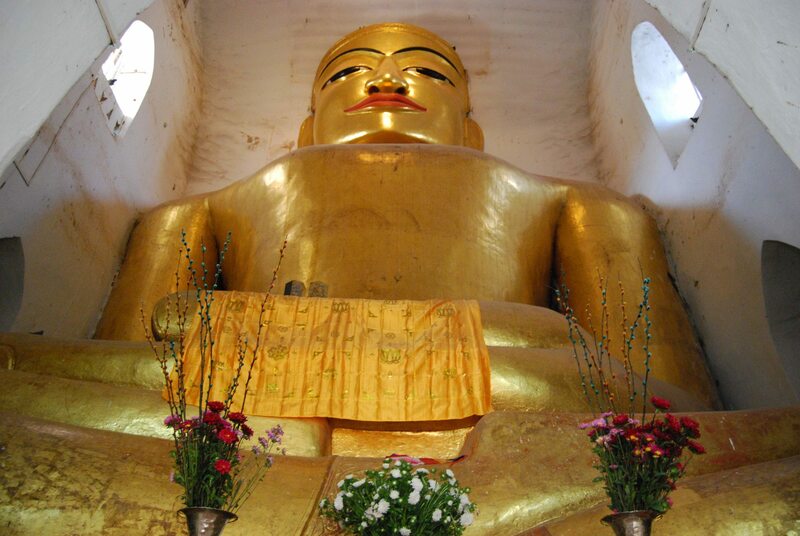 Bupaya Stupa – Golden, gourd-shaped stupa sitting on a temple by the river. A small cluster of habitations close to the river: Old Bagan, Myinkaba and New Bagan host the majority of the accommodation options in the area and have a selection of restaurants of varying quality. 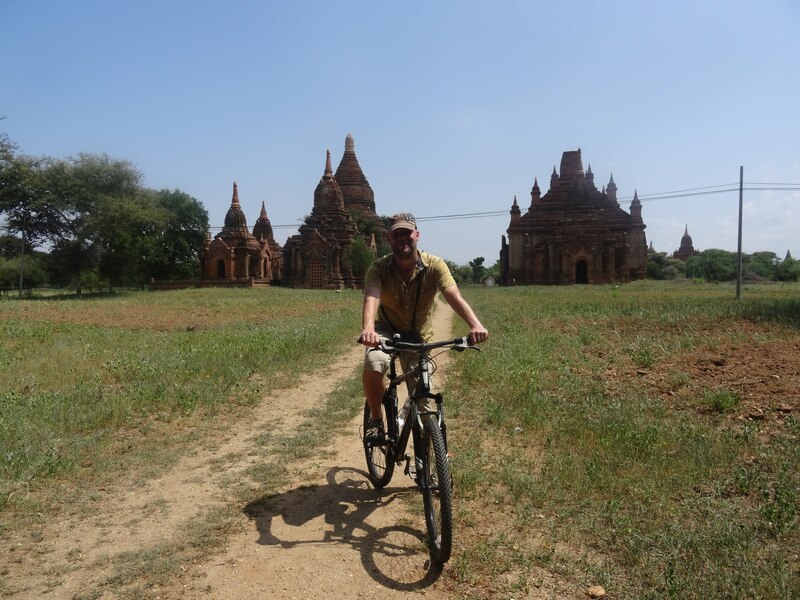 Many of the highlight temples and pagodas are located close to Old Bagan, and the countryside is ideal for some independent exploration on foot or bike. During the peak heat of March/April temperatures regularly head into the high 30s C (approx 100 F), so we recommend avoiding the midday heat and preparing appropriate clothing, sunhats and water. 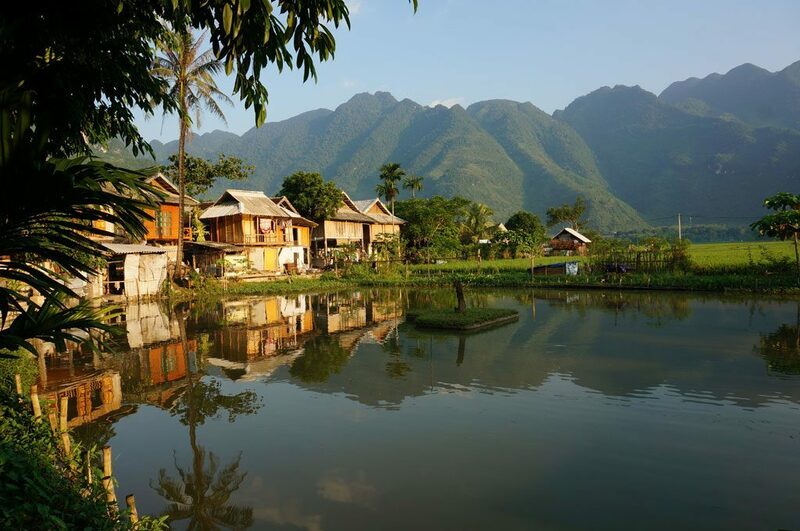 With so many temples and pagodas to explore it’s easy to get away from the tourist crowds, and for those feeling energetic there’s nothing better than hiring a bike and heading out. Bikes can be hired from most hotels, or from a number of places in Old and New Bagan. Ask your guide for their recommendations, but likewise make sure you prepare for the heat and take plenty of water. You can rent a horse cart with a driver for around 10000 – 15000 Kyats for a full day. The horse carts are slow, shaky, bumpy, and not exactly the most comfortable mode of transportation, but you’re sheltered from both sun and rain, so that’s a bonus. One good option is to rent a horse cart for 1 day to see the major temples, and then visit the remaining sights on bicycle the next day. 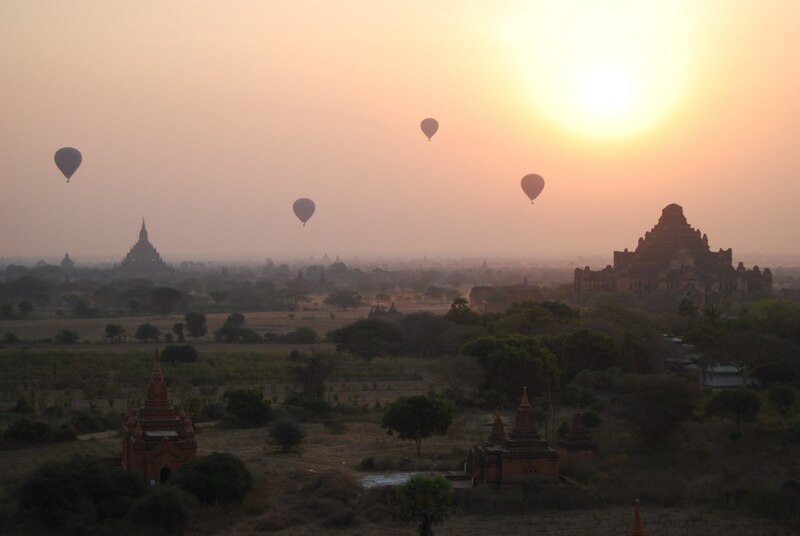 Hot air balloon has become a popular way to see Bagan, and is an enchanting (if expensive) way to get a handle on the size and scope of this astounding area. A dawn balloon ride costs about US$320-350 per person, and can be taken from October till April. Now is the time to visit this beautiful country!